This picture has so much meaning for me, especially with the little guy watching me quilt. It was 10 years ago this week that I was pregnant with our 3rd child, we had just sold our home and we were awaiting the arrival of Jonah so that we could head down to Saint George, Utah from Salt Lake to make a fresh start. Clint had quit his job and we decided that we would take Green Fairy Quilts to a new level by making it our full time business. I can still see the faces of family and friends as they tried to be supportive, but I knew deep down they thought we were crazy. I mean, who quits their job, sells their home, has a baby and moves 4 hours away from any family? At the time Clint and I were desperate for a change and knew this was right for us. We did have the money from the sale of our home to make this work and we had about a year to do it. At the time we knew our kids were young enough, they would not have any clue if we failed - our oldest was 3 at the time. The back story is that my mom and I had been working together and going to shows to sell my patterns and quilt kits. I had also learned to free motion quilt, not very well I might say, on my mom's machine and with our move, we would buy a quilting machine. Clint and I saw the potential in the business and we had always wanted to work for ourselves, so one day when Clint was working down here in Saint George, he looked around and said it felt like home. He immediately called me and said, "do you think we could sell the house and start the business down here?" I was desperate for a change and agreed. It was really hard to tell my mom, but she understood and was supportive. So, the house was put on the market, For Sale by Owner - we bought low and sold high. This was 2008 - we got every last drop of equity in that house and then waited to move after Jonah was born. We were in the house for 3 days and then moved down to Saint George. It was 2 weeks later that the housing market crashed - and it crashed hard in our area. This was the first miracle, we knew that God had been taking care of us and allowed timing to be perfect. 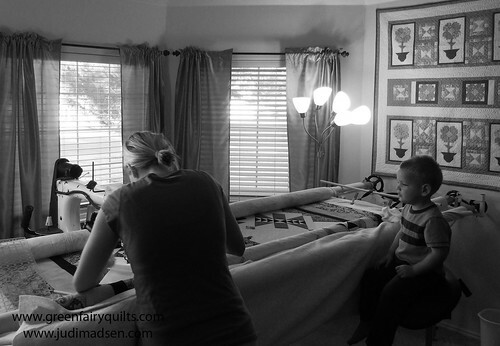 In October 2008 we finally got my own A1 longarm and I started quilting. I never had any lessons, so I had to teach myself, I knew a little free motion from using my mom's machine. I relied a lot on pictures I could find, but there really weren't a lot of resources back then. I said a lot of prayers and worked hard to build a clientele, the big breaks were the word of mouth references and blogging. I started this blog and shared what I was doing and looking back, I had no idea what I was doing. I spent hours and hours researching how to blog, how to make great photos, anything I could think of to make it better, I was doing. Meanwhile, Clint was building the website and he started adding precuts to the website. I remember in January 2009 our total sales on the website were just over $100.00 - definitely not an income for a family of 5 - but Clint was determined to make it work. I remember telling him several times that it wasn't working and that he needed to find a job, but he kept going, kept persisting and working harder and harder. He had the faith and determination to make this work and he helped me realize that we could do this. So many things have happened in the 10 years since that first move. Clint has built and maintained an incredible website, he works so hard. I have been able to take quilting to a whole new level with free-motion, ruler work and secondary designs. I feel like I have grown so much in my artistry and I know that this creative outlet has given me more than I could ever ask for. I went into this business wanting to just design quilt patterns, but it has turned into so much more. God has given us a better outcome than we could have ever imagined and for that I will forever be grateful. We have been blessed to have helped people in Romania with our charity, so many donations and quilts have been given and distributed, several trips have been taken to help those in need. We couldn't have done all of this without all of you. So many wonderful customers and friends we have gained along the way. There are so many wonderful memories I have and this anniversary has made me really reflect on those. There have been hard times, but the good times far outweigh the bad times. We work hard and have had to learn to juggle business, marriage, kids, religious obligations and extended family. I look back at the travels I have made to teach quilting - I didn't even know this was an option when I first started. I look back and realize the first 3 "no's" on book proposals were a huge blessing because it led me to AQS publishing and they couldn't have been more incredible to work with on my first and second book. Then, we filmed 3 iquilt classes - it's all crazy to think about. I really just wanted to work from home, and I have had more opportunities to travel than any WAHM could ever want. I have learned so much and grown in so many ways. Thank you so much for following us on our journey and for making the dreams we had come true. Life is a gift and we are so blessed. Thanks for listening. 10 years! Here's to 10 more! Who knows what the next 10 will bring, I can't imagine it being any better than it already is. I love your story. I took an iquilt class and learned a lot. You are an inspiration to a lot of people. Looking forward to the the next ten and ten etc. Bless you and your lovely family! I have taken your Iquilt classes, bought your books and have seen your quilts at Paducah. You are truly an inspiration. And you have made me want to be a better quilter. Thank you and your family for your time and dedication. You were the first quilter to inspire me and help me be brave and quilt it!! Thanks so much!! I hope some day to meet you in person. But I feel like I know you from your books and blog. And thanks for always answering my emails. God bless you and yours!! Judi, It has been a joy to follow you and so inspiring and educational. I quilt on a domestic machine and you have helped me more than you know. I love that you share the many beautiful photos of your astonishing work as well as your lovely family. You and Clint make a good team & I wish you even more success in the next 10 years!! Thank you for sharing your story…it embodies the qualities of trust and love, faith and commitment, determination and focused effort of hard work, goal setting and hard work. So inspiring. As much as your quilting is so lovely – just as lovely is your positive message and faith in our Lord. May you and your family be blessed for many many years…thank you for your continued sharing of love, faith and inspiring work!